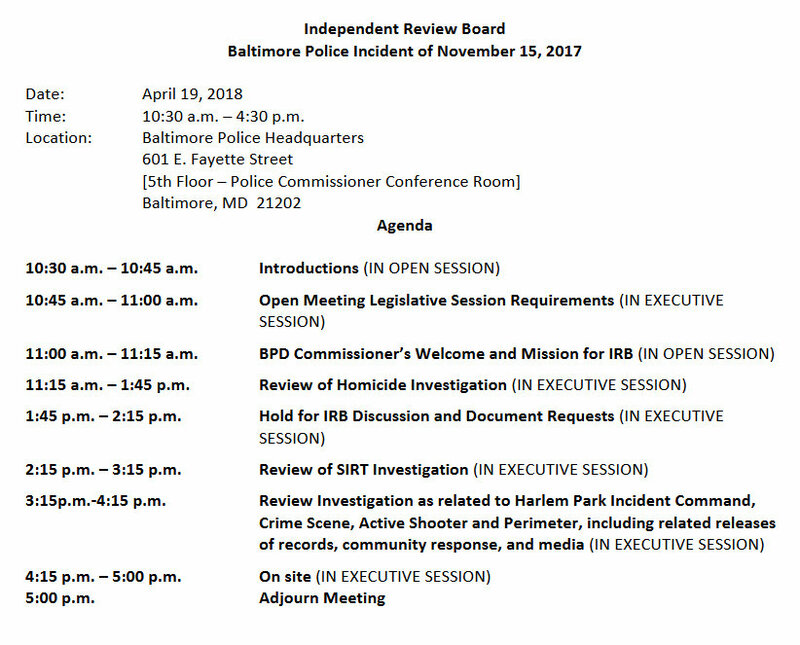 The newly assembled independent panel created to review the Baltimore Police investigation into the unsolved killing of Detective Sean Suiter in November is closing most of its first public meeting – and the ACLU is objecting. “I write to raise concerns about the planned closing of the entirety of the substantive portion of the IRB’s April 19, 2018 meeting, despite the acknowledgement that the IRB’s meetings are subject to the provisions of Maryland’s Open Public Meetings Act,” wrote David Rocah, legal director at the American Civil Liberties Union of Maryland. The letter, sent today, is addressed to James K. (Chips) Stewart, chairman of the Independent Review Board (IRB) and expresses concerns based on the agenda for tomorrow’s meeting of the seven-member panel. 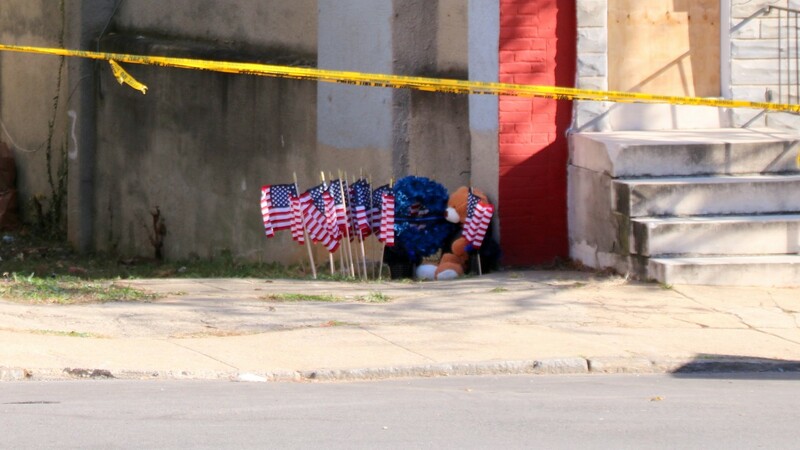 The group, assembled by Mayor Catherine Pugh’s police commissioner, Darryl De Sousa, will review both the Suiter shooting itself and the Police Department’s investigation of it, including the week-long cordoning off of the Harlem Park neighborhood where the veteran detective was mortally wounded. Baltimore Police spokesman T.J. Smith deferred comment to the IRB members. Independent Review Board chair Stewart has not yet returned a call from The Brew seeking comment on the letter. But other portions of the meeting to be conducted in “executive session,” he argued, do not clearly fall under the exceptions to the state’s Open Meetings Act (OPMA). Taking the other topics in turn, we are unclear what “Open Meeting Legislative Session Requirements” refers to. We presume it means a discussion of the statutory requirements of open public meetings. Assuming that to be the case, we cannot see how such a discussion would fall within any of the fourteen statutory exceptions to the requirement of an open public meeting. Gen. Prov. §§ 3-301, 3-305. The IRB Discussion and Document Requests section of the meeting also does not clearly fall within any of the statutory exceptions to the OPMA’s open meeting mandate. Presumably any discussion of the pending criminal investigation would have been completed in the prior agenda item, and a general discussion by the IRB, or a discussion of which documents to request, would not fall within any other exception. To the extent the discussion or the document requests relates specifically to the death investigation, or would disclose aspects of that investigation, only those portions of the IRB discussion could be closed, not its entirety. There is insufficient information in the agenda to indicate whether the review of the Special Investigation Response Team (SIRT) investigation may be properly closed. To the extent the SIRT has assisted in the investigation into Det. Suiter’s death, which we do not believe has been publicly reported (all reporting we are aware of has noted that the Homicide unit has been conducting the investigation), the closing of this portion of the meeting would appear warranted, as noted above. However to the extent the SIRT has been investigating anything else, it is not clear that closing is warranted, and further explanation is necessary, including what is being investigated, and why discussion of that investigation may properly remain confidential. The “review of the Harlem Park incident command, crime scene, active shooter and perimeter, including related releases of records, community response, and media” similarly does not appear to fall within any exception to the OPMA’s open meeting mandate. None of these topics relates to a discussion of what happened to Det. Suiter. Rather, they are discussions of, in part, command decisions about how police should respond to Det. Suiter’s death, decisions that, appropriately and understandably, in our view, generated a huge amount of public controversy, and are a part of the IRB’s mandate to review. If the public is to have any confidence in that review, it must be conducted in public, transparently, as the Police Commissioner himself has repeatedly pledged. And a discussion of public records requests, community responses to the BPD’s actions, and media coverage of the BPD’s response are also clearly distinct from the actual investigation into Det. Suiter’s death, and clearly do not fall within any of the 14 exceptions to the OPMA’s mandate. This discussion should be held in open session, absent additional information justifying closure. It is not clear what the “on site” portion of the agenda refers to. 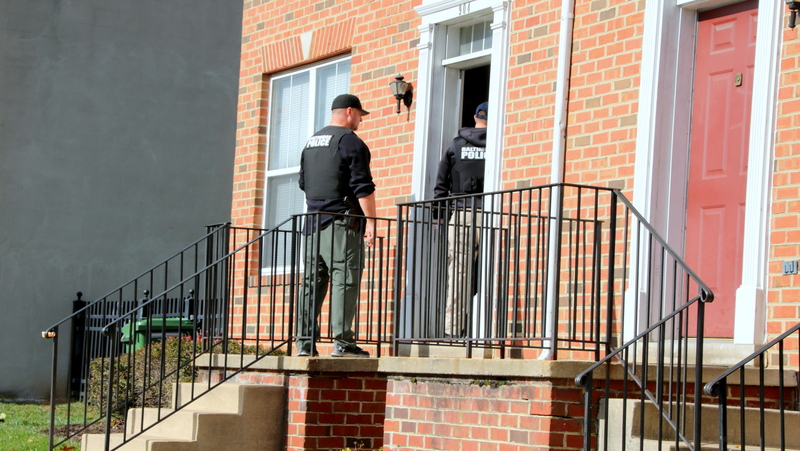 To the extent it refers to an IRB visit to the scene of Det. Suiter’s death, we do not see how such a visit could be closed to the public (or even what executive session would mean in this context). To the extent it means that the IRB intends to prevent the public from observing what the IRB does or says during any such visit, we think such actions would violate not only the OPMA, but the First Amendment as well. Finally, we note that the OPMA was recently amended to require that public bodies designate a member to receive training on the OPMA (and that member must attend any meeting where the public body votes to close any part of its discussion). Gen. Prov. § 3-213(d). Which member of the IRB has been designated for this training, and when did it occur?